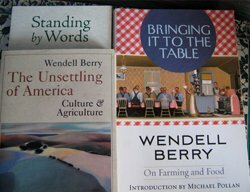 The National Endowment for the Humanities [www.neh.gov], which supports research and learning in history, literature, philosophy, and other areas of the humanities by funding selected, peer-reviewed proposals from around the nation, has honored Wendell E. Berry, the noted farmer, philosopher, poet, essayist, novelist, and conservationist, with perhaps the most prestigious honor the United States bestows for distinguished intellectual achievement in the humanities. Berry will deliver the 2012 Jefferson Lecture in the Humanities sponsored by the National Endowment for the Humanities (NEH) at The John F. Kennedy Center for the Performing Arts in Washington, DC on Monday, April 23, 2012 at 7:30PM. The Jefferson Lecture is the NEH’s most widely attended annual event. Past Jefferson Lecturers have included Lionel Trilling, Saul Bellow, John Updike, Henry Louis Gates, Jr., David McCullough, Tom Wolfe, Toni Morrison, Arthur Miller, James McPherson, Barbara Tuchman, and Robert Penn Warren. The lectureship carries a $10,000 honorarium. Mr. Berry’s words provided inspiration for the mission of www.knowwhereyourfoodcomesfrom.com to promote CSAs (community supported agriculture farms), farmers markets, and farm-to-table restaurants: “Every time you make a decision about food, you are farming by proxy,” The Art of the Commonplace, edited by Norman Wirzba (Berkeley, CA, Counterpoint, 2003). In his writing and activism, Berry has spent his career meditating on our relationship and responsibilities to the land and community. He is the author of more than forty books of poems, essays, short stories, and novels, many of which draw on the traditional rural values of Berry’s native Kentucky. From his first book of poetry, The Broken Ground (1964), Berry has explored themes of living in harmony with nature, and the bonds of marriage, family, and community. One of the most widely read poets in America, his collections of poetry include: There is Singing Around Me (1976), Clearing (1977), Entries: Poems (1994), A Timbered Choir: The Sabbath Poems 1979-1997 (1998), and Given (2005). A New York Times review by poet David Ray [www.davidraypoet.com/] www.nytimes.com/1985/11/24/books/heroic-mock-heroic.html?scp=1&sq=Wendell+Berry+Collected+Poems%2C+1957-1982&st=nyt of Berry’s Collected Poems, 1957-1982 (1985) described Berry’s style as “resonant with the authentic. The lyricism is not forced, but clearly grows out of a deep bond with the earth . . . .” In novels and short story collections such as Nathan Coulter (1960), A Place on Earth (1967), The Wild Birds: Six Stories of the Port William Membership (1986), and Jayber Crow (2000), Berry has chronicled generations of farming families in the changing landscape of a fictional small Kentucky town of Port William [www.wendellberrybooks.com/]. Berry was born in 1934 in Henry County, Kentucky. He studied English at the University of Kentucky, where he earned a B.A. in 1956 and M.A. in 1957. In 1958, Berry received a Wallace Stegner Fellowship from Stanford University. He has taught at Stanford University, Georgetown College, New York University, the University of Cincinnati, Bucknell University, and the University of Kentucky. He is the recipient of numerous awards and honors, including Guggenheim and Rockefeller Foundation fellowships, the American Academy of Arts and Letters Jean Stein Award, a Lannan Foundation Award for Non-Fiction, the Ingersoll Foundation’s T.S. Eliot Award, and the Aitken-Taylor Award for Poetry from The Sewanee Review. He is an elected member of the Fellowship of Southern Writers. Last March Berry was awarded a National Humanities Medal by President Obama. Tickets to the lecture are free of charge and distributed on a first-come, first-served basis. Ticket requests may be submitted via the online form.